Hedging was planted along the busway in March 2013 with the remainder of the boundary planted in December 2013. Native species were used including hawthorn, rowan, blackthorn, birch, hazel common oak and elm along the busway and hawthorn, hazel, blackthorn, crab apple, dog rose, elder and beech along the rest of the boundary. The hedge will be kept to 1m high. The boundary is about 270m long, with straight sections of 78m on the Southern and Eastern side of the site and a curved section of 110m on the North side of the site. A survey of hedges adjacent to the orchard site, Histon Woods and Girton Woods, made on 31/5/2012, recorded the species shown in the table to the right. There is a gate suitable for machinery access in the SW corner of the site and a pedestrian gate (suitable for disabled access) in the NE corner. The boundary was planted by community and workplace volunteers (from GE Energy and Barclays Bank) in March 2013 and December 2013. The Woodland Trust provided the majority of the hedge plants, through their Community Tree Pack Scheme. We are also very grateful for the assistance of Chivers Farms for help with the preparation and fencing. The fencing is temporary and will be removed once the hedge is established. There are four distinct areas of planting. This area on the southern side of the site is a mixture of fruit trees planted on MM106 rootstock, planted 5m apart in a traditional quincunx pattern. These trees are being pruned to have a half standard form – the trunk will be about 1.3m high, and the trees will reach a total height of 3-4m, making the fruit relatively easy to havest. 14 apple trees, 3 gages and 2 pears, all associated with East Anglia have been selected to give a broad range of flowering times, fruiting times, pollination groups, flavours, and history. Lord Peckover – a particularly early-fruiting dessert apple. These 19 trees were planted at a community planting event in March 2013. Seven apple trees mark out a circular clearing, sufficiently large to form an outdoor classroom for use by schools or for other community events. The 7 trees are the 7 apple varieties most closely linked to Histon, Impington, Cottenham and Cambridge. The trees are on M25 rootstock, and are being pruned to have a standard form – the height of the clear trunk will be up to 2m. These trees will take longer to mature, and the fruit will be much harder to pick, but they will grow into majestic specimens around the central clearing. These trees were planted by children from the village primary schools in March 2013. This group of 14 fruit trees have been planted about 8-10m apart in a meadow setting, with the focus for this area being the provision of a wildlife habitat. As well as apple trees, there are cherries, gages, a medlar, a quince and a mulberry bush. 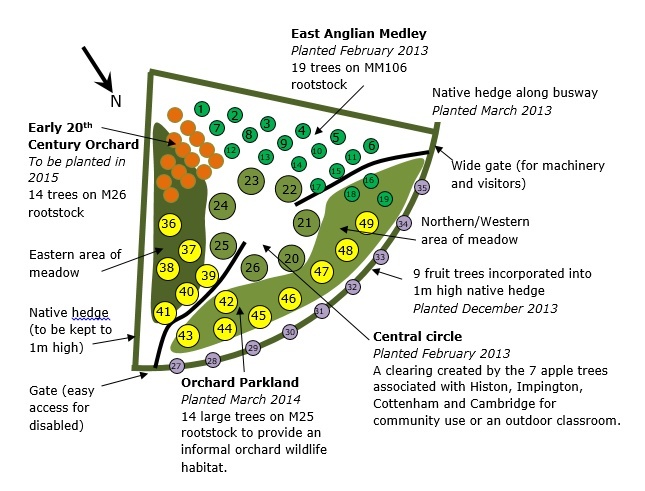 The trees are mostly on M25 root stock, with the tallest trees in the Northern part of the orchard. These will grow to be about 4.5m tall. These trees were planted at a community planting event on 8 March 2014. 4. Early 20th Century Orchard. This section of the orchard is representative of the type of orchard that was a common sight in this area in the early 20th Century. The trees were planted in February 2015. They’ve been planted in a traditional quincunx pattern. They are mostly Chivers Delight, or Newton’s Wonder, together with a few pollinators and are all trees grown commercially in Histon and Impington. The trees have been on an M26 rootstock, and so will be the smallest trees in the orchard, growing to between 2.4m and 3m tall. The site has been uncultivated grass, mown once or twice a year for at least 20 years. The soil appears rich, and three soil samples taken across the site gave a pH of 6. A survey of species undertaken on 5 May 2012 recorded the species shown in tables to the right. We conducted a trial meadow seeding. In 3 areas of the site, the grass has been removed in 3 sections (9 sections in total). In each of the three areas, one section was seeded with Emorsgate EM3 meadow mix, one section was left, and one section seeded with Emorsgate EM4 meadow mix. We have begun to increase the diversity of plant species in the meadow by impregnating the site with meadow flowers. This is being achieved by a Community ‘meadow in a tray’ approach; individuals, schools and other interested parties are given plant trays and a pinch of meadow flower seed (usually the flower component of EM3 from Emorsgate Seeds). Once the plants are established in the tray, they are planted in the orchard. In the summer we mow paths. These look great and are a traditional and low-cost approach to paths. There are seats and picnic benches, including a membrance seat provided by the Royal British Legion. In 2015, children from the Junior School build three ‘Bug Hotels’ that provide a variety of habitats for insects. Now that the main elements of the orchard have been established, we are looking at other items to include such as art, bee hives, or other features. 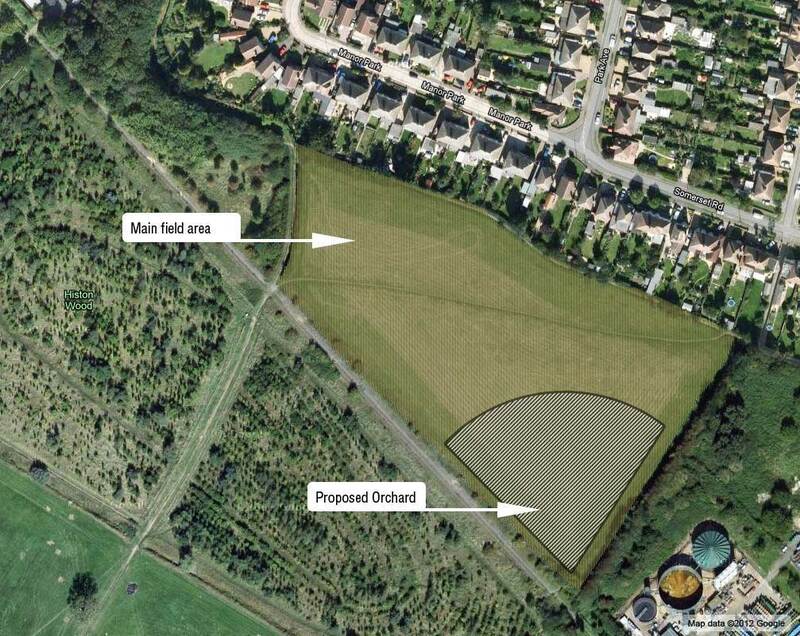 The orchard is in the Southern corner of the field to the South of Manor Park and Somerset Road, Histon.